Aggression and competition are customarily presented as the natural state of affairs in both human society and the animal kingdom. Yet, as this book shows, our species relies heavily on cooperation for survival as do many others—from wolves and dolphins to monkeys and apes. A distinguished group of fifty-two authors, including many of the world's leading experts on human and animal behavior, review evidence from multiple disciplines on natural conflict resolution, making the case that reconciliation and compromise are as much a part of our heritage as is waging war. Chimpanzees kiss and embrace after a fight. Children will appeal to fairness when fighting over a toy. Spotted hyenas, usually thought to be a particularly aggressive species, use reconciliation to restore damaged relationships. As these studies show, there are sound evolutionary reasons for these peacekeeping tendencies. 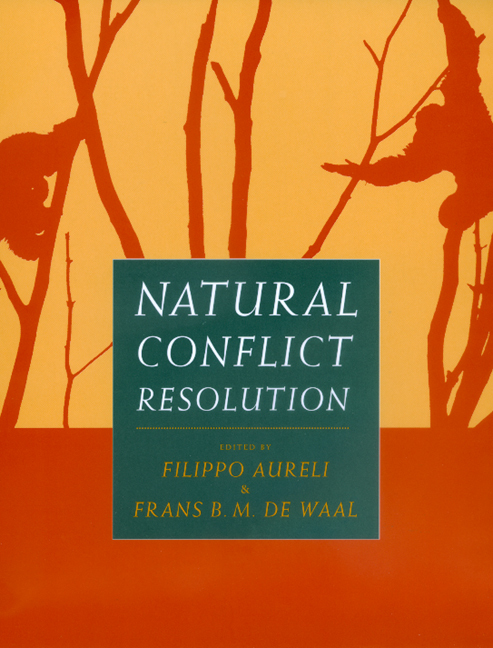 This book also addresses the cultural, ecological, cognitive, emotional, and moral perspectives of conflict resolution. Filippo Aureli is Senior Lecturer in the School of Biological and Earth Sciences at the Liverpool John Moores University, and Collaborative Scientist in the Psychobiology Division of the Yerkes Regional Primate Research Center of Emory University. Frans B. M. de Waal is C.H. Candler Professor of Primate Behavior in the Psychology Department of Emory University, and Director of Living Links at the Yerkes Regional Primate Research Center. He is the author of Bonobo: The Forgotten Ape (California, 1997), among other books.